Boaz began his martial art path while attending the police academy in 1983. 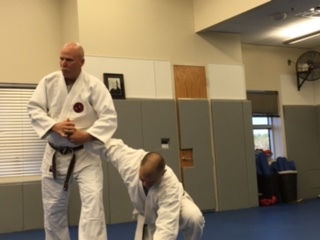 He first started in American Jiu jitsu, but quickly switched to Aikido under the late Dr. Tom Walker of Sand Drift Aikikai Dojo. Boaz continued his training and was one of Walker Sensei’s Uchi-deshi (live-in student) in the late 80’s and early 90’s. Boaz continued his training under Dr. Alan Drysdale, Enmei Aikikai Dojo. Boaz still considers Drysdale Sensei his mentor even today. Boaz is featured in Drysdale’s two books “Doing Aikido” Volume 1 & 2. Boaz was able to utilize his skills as a law enforcement officer for over 30 years. From actual street experience, Boaz learned how to apply Aikido techniques to subdue violent offenders and credits Aikido for saving his life on several occasions. Boaz has actually testified in a court of law as a expert on self defense issues. Boaz’ philosophy is simple. Have fun while training and if you always have a beginners mind, you will always learn.